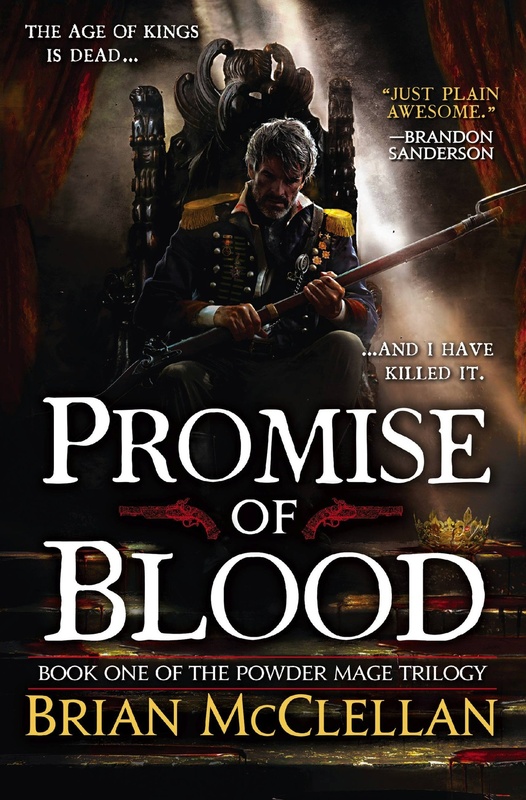 From debut author Brian McClellan comes a thrilling fantasy about politics, kingdoms, and the retribution that falls swiftly on broken promises. Read the first four chapters and become a fan of the Powder Mage trilogy on Facebook for news and updates. The carriage approached the front gate of Skyline and moved on without a stop. Adamat clutched at his pant legs and peered out the window. The guards were not at their posts. Odder still, as they continued along the wide path amid the fountains, there were no lights. Skyline had so many lanterns, it could be seen all the way from the city even on the cloudiest night. Tonight the gardens were dark. Adamat was fine with this. Manhouch used enough of their taxes for his personal amusement. Adamat stared out into the gardens at the black maws where the hedge mazes began and imagined shapes flitting back and forth in the lawn. What was . . . ah, just a sculpture. Adamat sat back, took a deep breath. He could hear his heart beating, thumping, frightened, his stomach tightening. Perhaps they should light the garden lanterns . . . He was at the main entrance. By day, it was a grand avenue of marbled walks and fountains, all leading to a pair of giant, silverplated doors, themselves dwarfed by the sheer façade of the biggest single building in Adro. Adamat listened for the soft footfalls of patrolling Hielmen. It was said the king’s personal guard were everywhere in these gardens, watching every secluded corner, muskets always loaded, bayonets fixed, their gray-and-white sashes somber among the green-and-gold splendor. But there were no footfalls, nor were the fountains running. He’d heard once that the fountains only stopped for the death of the king. Surely he’d not have been summoned here if Manhouch were dead. He smoothed the front of his jacket. Here, next to the building, a few of the lanterns were lit. It was a man in uniform, but little could be discerned in such ill light. He held a rifle or a musket, trained loosely on Adamat, and wore a flat-topped forage cap with a stiff visor. Only one thing could be certain . . . he was not a Hielman. Their tall, plumed hats were easy to recognize, and they never went without them. “I’ll help with the bodies in a moment,” Tamas said. “I’m old, need some rest now and then.” The Deliv gave a sharp nod and disappeared. Brian McClellan is an avid reader of fantasy and graduate of Orson Scott Card’s Literary Bookcamp. When he is not writing, he loves baking, making jam from fruit grown in northeast OH, and playing video games. He currently lives in Cleveland, Ohio with his wife.